If you're new to software product management or just want to learn more about it, there's plenty of advice available-but most of it is geared toward consumer products. Creating high-quality software for the enterprise involves a much different set of challenges. In this practical book, two expert product managers provide straightforward guidance for people looking to join the thriving enterprise market. 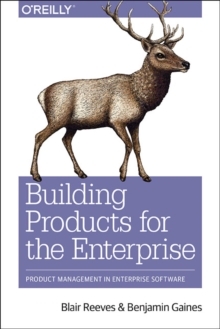 Authors Blair Reeves and Benjamin Gaines explain critical differences between enterprise and consumer products, and deliver strategies for overcoming challenges when building for the enterprise. You'll learn how to cultivate knowledge of your organization, the products you build, and the industry you serve.